Your hips bear your weight, support your torso and allow your legs to move. When you’re in hip pain, you can’t move without a shock of pain. A cortisone injection in the hip eases that pain, allowing you to go back to your daily routine. A hip steroid injection may even let you get back to your favorite sport. Hip injections reduce inflammation while it kills pain. If you’re experiencing hip pain, ask your doctor about a hip joint injection. Make an appointment in our sports injury and pain management clinic in NYC to get your pain evaluation and treatment. While your shoulders provide the functionality and wide range of motion your arms need, your hips help you maintain your balance and mobility. Since they’re weight-bearing joints, your hips have to be strong but well-lubricated to allow your legs to move without pain or friction. The system of muscles, ligaments, tendons and nerves that pass through your hips allow you to do everything from balancing on one leg to running and jumping at full speed. Hip pain from a medical condition like tendonitis or an injury to your hip makes your life agonizing. As with back pain, a sore hip hurts no matter what position you try — sitting, standing or lying down. If over-the-counter non-steroidal anti-inflammatory drugs (NSAIDs) don’t help, you need to see your doctor in Manhattan to find out what treatment options are available. Your doctor may need to inject the steroid medicine in multiple spots to adequately surround the painful area in your hips. You most likely need to lie on an x-ray table during the procedure so your doctor can use a fluoroscope to guide the position of the needle. But the injection spot is numbed with a topical anesthetic before the procedure begins, so you won’t feel much of anything. Because there are so many ways to hurt your hip, from blunt force trauma to slow-developing arthritis, a hip joint injection can’t cure every condition all the time. It’s possible it won’t work on you. But it’s been so successful in treating hip pain that it’s worth the rare risk. Normally, you just need to take it easy for the rest of the day. After the local anesthetic in the hip steroid injection wears off, usually within three hours, your pain may return. But once the medication starts to work, often within three days, your pain levels drop dramatically. Follow your New York City physician’s post-injection care instructions to minimize the risks and promote the effectiveness of the procedure. If you develop a fever, contact your doctor right away. Keep the injection spot clean and dry to avoid infection, which is the most common risk. Don’t exert yourself until you feel the steroid medicine start to work. Even then, you need to give your body time to heal, so don’t rush back onto the court or playing field. If you do, you risk injuring yourself again. 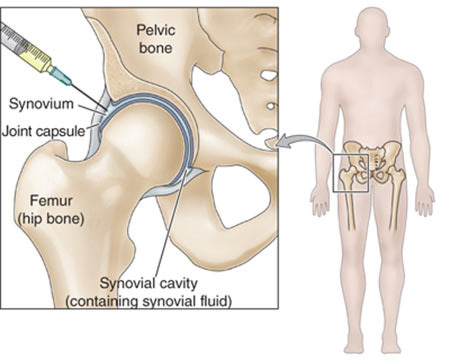 Do you have any questions about the hip joint injection treatment for hip pain we offer in NYC? 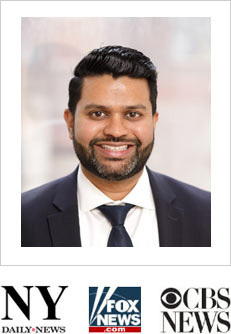 Would you like to schedule an appointment with the best rated hip pain management doctor Febin Melepura MD of sports pain management clinic in New York? Please contact our office for consultation with the pain relief specialist in Midtown Manhattan.